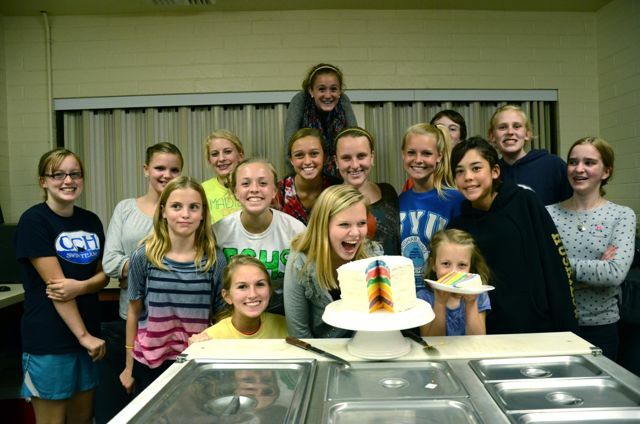 Recently I attended a class with my daughters where we learned how to make a rainbow layered cake. 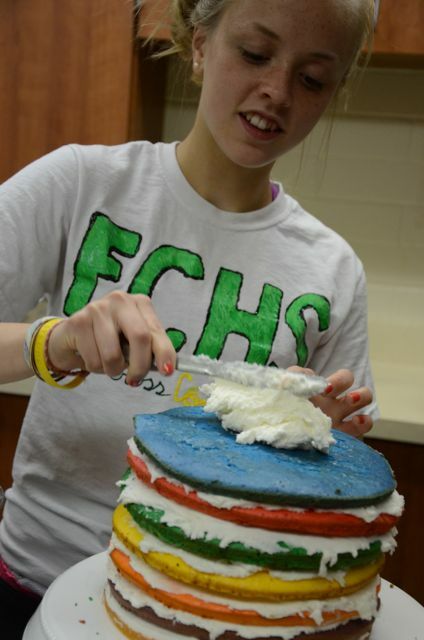 Normally not much a cake baker myself, I fell in love with seeing everyone's reaction at the end when they cut the cake and pulled out that first rainbow colored slice. I enjoyed the reaction so much that when my son's birthday rolled around recently I decided that I would make one for his birthday party. 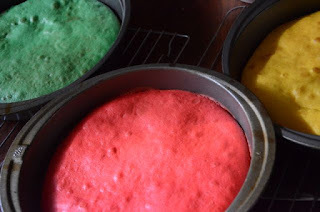 I was impressed with how simple it was to make (using 2 cake mixes) and I loved that it had every bit of that WOW factor for the 10-year-old boys as it did for the teen girls! 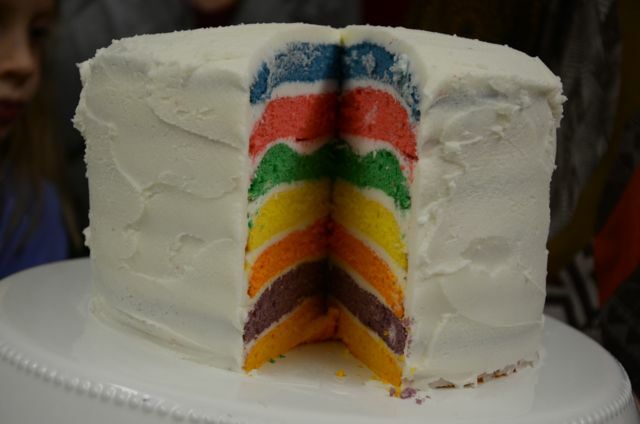 Taking the inspiration from the rainbow colored cake, my 11-year-old daughter decided to make her own version. 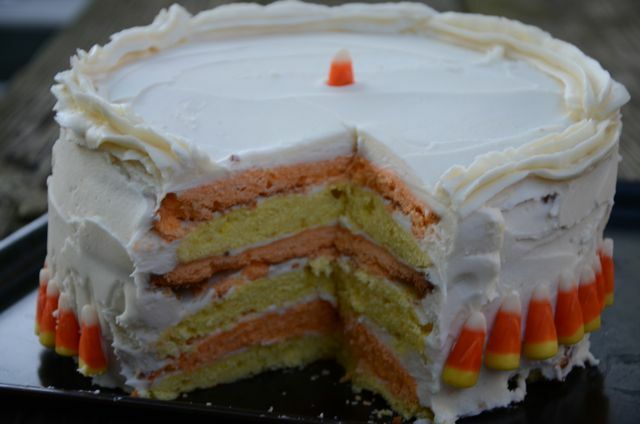 She thought it would be fun to create this candy corn colored cake and decorate the outside with candy corns. I think it turned out beautifully well, although I had to laugh that at eleven-years-old, her cake decorating skills have already bypassed my own! CAKE: Mix together the cake as directed on box. 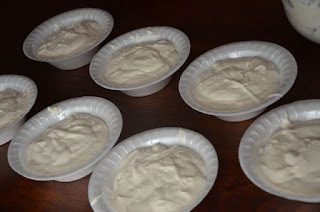 Divide the batter evenly among seven small bowls (if you're using a double Duncan Hines cake mix it should be about a heaping cup of batter in each bowl). 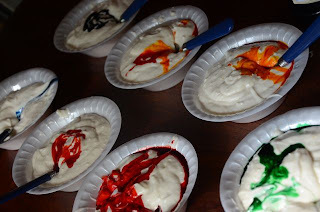 Dye each bowl of batter your desired color. 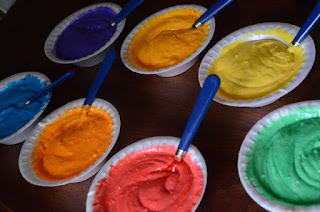 You will have to be liberal with the food coloring in order to get it bright enough. Read the box of food coloring to get an idea of amounts. 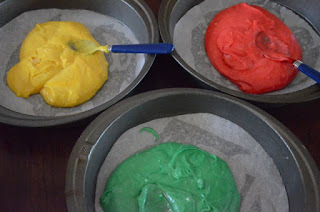 After each bowl of batter is mixed well and dyed to your desired color, add to a greased 9-inch circle baking pan with parchment paper lining just the bottom. 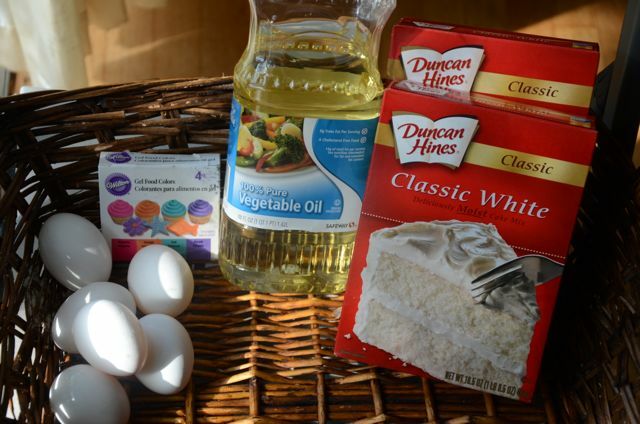 Spread batter evenly to the edges and pound pan on counter top to get rid of any air bubbles that may remain. Bake at 350 degrees for 9-minutes. Allow each layer to cool in the pan for about 5 minutes, then carefully remove from pan and allow to cool on a wire rack. 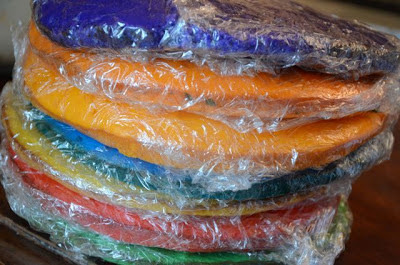 After layers are cool, wrap in plastic wrap and place on a flat surface in a freezer. It's okay to stack them. 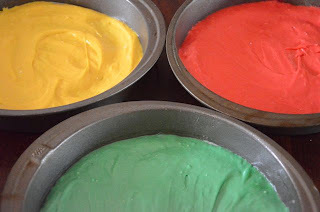 Allow to freeze for 1 hour or more, then place the color of layer you want on the bottom onto a cake platter. 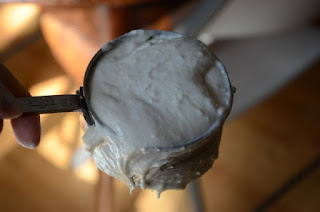 FOR FROSTING: Mix all ingredients together, adding a tablespoon of milk at a time until the right consistency is reached. 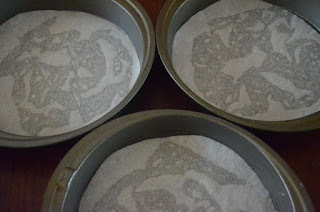 Frost each layer liberally to the edge of the round and place the next layer on top until you've reached the top layer. If you have time, do a light layer of frosting over the whole cake, then place in the freezer for 1-2 hours, then refrost with a pretty layer of icing. If you don't have time to do a second coating, just frost it the best you can. To serve, cut into slices and wait for the oohs and aahs! This cake looks wonderful! It is perfect for kids birthday celebration. so fun! my daughter would flip!